(CNN) A prosperity gospel televangelist from Louisiana says Jesus has asked him to buy a new private jet. And wouldn't you know it, Jesus has real nice taste in planes. Jesse Duplantis, leader of Jesse Duplantis Ministries and the owner of three other private jets, is asking his followers to chip in so his ministry can purchase a brand new Dassault Falcon 7X, which runs about $54 million. In a video recently published on his website, Duplantis says the planes get him closer to the Lord -- both literally and figuratively -- and he had a divine conversation in which Jesus asked for the new aircraft by name. "It was one of the greatest statements the Lord ever told me, he said, 'Jesse do you want to come up where I'm at?'" the minister says. "'I want you to bleed me for a Falcon 7X.'" By "bleed," Duplantis -- er, Jesus -- apparently meant "ask for donations." Duplantis goes on to tell his followers that jets, especially nice ones with good fuel efficiency, allow him and his ministries to reach more people around the world. And no, it wouldn't technically be his, it would be the ministry's. "All it's gonna do is it's going to touch people, it's going to reach people, it's going to change lives one soul at a time," Duplantis said of the aircraft. "I really believe that if Jesus was physically on the earth today, he wouldn't be riding a donkey," he added with a chuckle. In the video, Duplantis also shows his followers a photo of him standing beside his other three jets: a Cessna Citation 500, an IAI Westwind II, and a Dassault Falcon 50. Under the portrait is a quote, which he proudly reiterates: "It's not about possessions, it's about priorities." Duplantis shows his followers a photo of him standing with his other three jets. CNN has reached out to Duplantis for comment. On its website Dassault boasts that the Falcon 7X combines "fighter jet technology with an elegant, whisper-quiet executive cabin." If this all seems a little spendy, you may not be familiar with the concepts behind prosperity theology. According to prosperity gospel preachers and believers, nice things like jets and cars and rent money are God's way of blessing people for a faithful life. And by their logic sharing your wealth with the church will make God bless you even more. 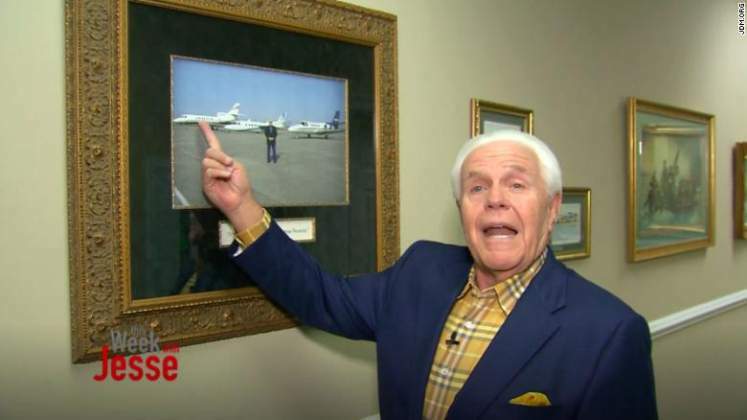 It's maybe no surprise then that big-name prosperity gospel preachers have a thing for jets. To them, such luxury is not at odds with Jesus' teachings of moderation and humility. And Duplantis is not the only preacher claiming to be having conversations with the Almighty about mid-range business aircraft. In 2015, megapastor Creflo Dollar faced a backlash after asking his followers for $60 million for a Gulfstream G650. Earlier this year, prosperity preacher Kenneth Copeland acquired a Gulfstream V jet from director Tyler Perry, paid for by donations from his followers. Copeland and Duplantis also discussed the necessity of private jets on a 2016 episode of Copeland's show, "Believer's Voice of Victory," during which Copeland described commercial air travel as being "in a long tube with a bunch of demons." "The world is in such shape, we can't get [to followers] without [private jets]. We've got to have them," Copeland said. Copeland noted that famed evangelical pastor Oral Roberts flew commercial, but the people on the planes "agitated his spirit" with their requests for prayers. "You can't manage that today," he said.